Cucumbers, a warm-weather vegetable, are often started from seed. Planting the seed indoors allows you a head start on the summer gardening season. 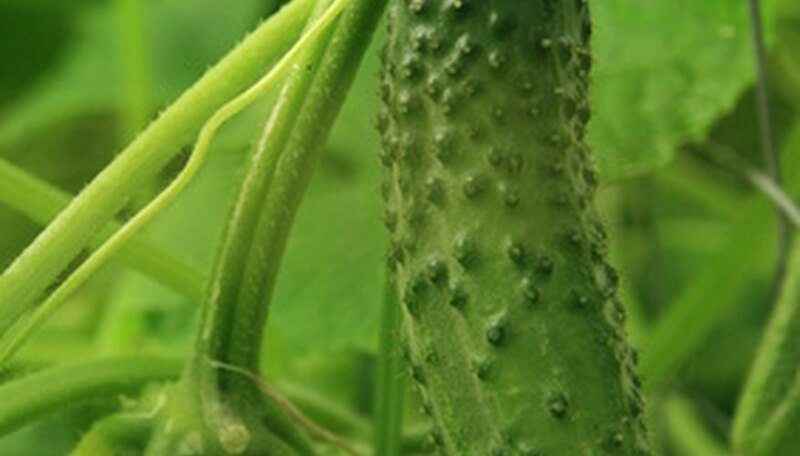 Cucumbers have sensitive roots that do not tolerate disturbance well. Use biodegradable peat pots for indoor seed-starting. These pots are planted directly into the garden bed, where they then break down, so the cucumber roots are not disturbed. Plant cucumber seeds indoors four weeks before the last expected spring frost so that the plants are not too large at transplanting, advises the University of Minnesota extension. Fill 3-inch diameter peat pots with a well-drained potting mix. Leave a ½-inch space between the top of the potting mix and the pot's rim. Sow one cucumber seed per pot, planting it ½ inch deep. Water the potting mixture until the excess moisture begins draining from the bottom of the pot. Cover the pots with a plastic bag, which helps retain soil moisture during germination. Place the pots in a 65- to 75-degree F room. Remove the bags once seedlings emerge, usually within seven days. Place the pots in a warm, sunny windowsill. Water the seedlings when the soil surface just begins to feel dry. Empty the drip tray under the pots after watering, because standing water can damage seedlings. Transplant cucumber plants out to the garden after all frost danger is past and once soil temperatures reach about 70 degrees F.
Instead of peat pots, you can use compressed peat pellets. The pellets expand once watered and supply both the planting medium and the pot. The entire pellet is planted out to the garden. The rim of the peat pot wicks moisture away from the cucumber if the rim protrudes above the soil surface. Tear the rim off the pot prior to planting to prevent this from occurring.